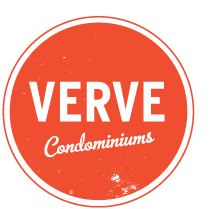 Are you looking to buy a pre-sale or pre-construction condo in the Calgary Verve development? Do you own a pre-sale condo that you would like to sell? Please call Julie Dempsey at 403-923-6299 for more information. If you're into architecture, the brilliant minds at Giannone Petricone Architects have created something fresh, something new, something so cool that it'll look as great in 50 years as it does today. Fritted glass, punctuated by colourful vertical highlights and an arrangement of geometric balconies. A six storey podium that lends scale and context to the bustling street scene on the Riff, and houses the lobby off 6th Ave. Inside, perch and people watch across from the sculptural fireplace, or connect to the in-house WiFi and broadcast your thoughts to your social networks. Atop the tower, admire the city's skyline from the rooftop lounge and terrace. Rising 25 storeys, Verve offers a unique balance of shops and residences, creating a vibrant environment where everything is within reach. There are 290 suites, including a selection of exclusive live/work units. From cozy one-bedrooms, to spacious penthouses, find what you love at Verve. Live at Verve and every day will start with a smile when you realize that "home" includes an entire floor of awesome amenities. Endless options for fun exist. Drag a friend into the fitness studio and cheer each other on for another downward dog or one more rep.
Make maximum use of warm summer nights lounging in a cabana, looking onto the zen garden. Cozy up around the outdoor fire pit or make a splash in the jacuzzi – the perfect après ski plan. Cook up a storm in the party room kitchen, then dance it off in the lounge. There's no end to what you can do at Verve. Whatever you're looking for, you'll find more of it in East Village. Touted as Calgary's newest, oldest, coolest, warmest neighbourhood, this master-planned community has something for everyone.